Dogs are like humans in some ways, especially when it comes to their temperament. Some dogs would not mind traipsing into the office of a vet, but others have this strange sixth sense that tells them that this trip in the car would end up in a world of syringes and that man or lady in a white lab coat. Well, some dogs who have had surgery performed would have to wear a cone to prevent them from licking the sore area, so why not take that idea and use it to inspire a $31.99 Good Dog Cone of Shame Speaker? 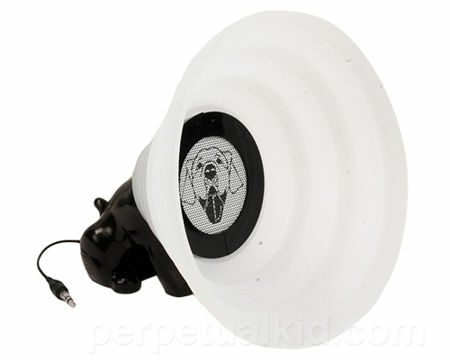 The Good Dog Cone of Shame Speaker will obviously target those who happen to have their sense of humor intact, as it adds music playback in the form of a collapsible Good Dog Cone of Shame Speaker. The flexible and collapsible cone is made of a soft silicone and the cable will hook up to your device via a 3.5mm jack, so forget about any kind of wireless connectivity with this puppy (pun intended).